Skerries Harps 3-1 vs. Nh Olaf 4-2. 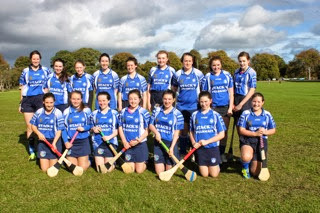 Skerries Harps made the trip up to the home of Dublin Camogie in the Phoenix Park to play the Under 15 Division 2 Shield Final. There was great excitement and anticipation among this small but committed group of players who were proud to represent the Harps in this Final. On arrival in the Park there was great display of Camogie colours with representatives from teams throughout Dublin playing their finals too. The Harps looked well turned out in their Blue, White and Navy strip. Their parents and supporters all turned up in great numbers to cheer them on. The match started with an even contest for the first 15 minutes unfortunately we lost a half forward, Megan MacNicholas, to injury ten minutes into the game. Each ball was fought for in midfield by Laura Hyland and Emma Dardis despite being under pressure. Our centre back line of Maura O Callaghan, Veronica Fay-Watt and Alex Rice delivered ball to half forwards, Sive Duncan, Alix Buckley and Kayla Walsh who were trying hard to press forward but under huge pressure to win ball. 15 minutes Naomh Olaf got on top but the Skerries half back defence line stood strong, driving the ball against the strong wind out of defence. The full back line of Caroline Sisk, Suin McGabhann and Gillian Cashman fighting a near onslaught and with some great clearances by our goalie, Abbey Downey, we went into half time down 1-1 to no score. The second half started as the first ended with Naomh Olaf attacking strongly and pulling away to lead by 3-2 to zero with 15 minutes to go in spite of the wind being with Harps. Harps moved their centre back, Veronica Fay-Watt, up to centre forward which then changed the direction of the match. A long distant point from a free by Veronica Fay-Watt started a 15 minute period of dominance by the Harps with great effort from Róisin O Connor, Caoimhe Fichtnor and Aisling McNally in the full forward line. Veronica rattled 2 outstanding goals into the top of the net to close the score to 3-2 to 2-1. We had momentum but unfortunately at this stage a hard worked ball put over the Olaf goalie’s head into back of the net was disallowed. Olaf then upped their game and answered with a 20 metre free into the back of the net against the run of play. Our supporters were silenced. Harps dug deep and fought back and a goal built from the backline, through to our half forward line resulting in a shot on goal by Veronica and finished into the net by Grainne Murphy. Unfortunately time had run out for us and the game finished with a respectable final score of Harps 3-1 to Olaf 4-2.